Nuclidic Masses Johnson Walter H.Jr. Auteur : Johnson Walter H.Jr. 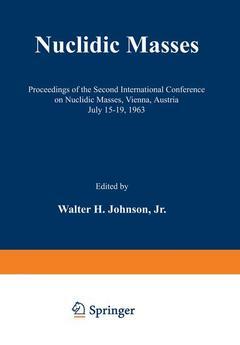 The Second International Conference on Nuclidic Masses was held in Vienna, Austria, July 15-19, 1963, using facilities of the International Atomic Energy Agency. This was the third conference in the general area of nuclidic masses in recent years. The first, a symposium held at the Max Planck Institut fur Chemie in 1956, was international in character but not in name. The First International Conference on Nuclidic Masses was held at McMaster University in September of 1960 in conjunction with and shortly after the meeting of the General Assembly of the International Union of Pure and Applied Physics and the Kingston Conference on Nuclear Structure. The Second International Conference on Nuclidic Masses was held under the sponsorship of the International Union of Pure and Applied Physics and the Nuclear Science Committee of the National Academy of Sciences-National Research Council of the United States. Financial support for the conference came from the United Nations Educational, Scientific, and Cultural Organization. The conference committee was made up of the following individuals: Chairman: J. H. E. MATTAUCH General Secretary: H. E. DUCKWORTH Local Secretary: F. P. VIEHBOCK w. W. BUECHNER B. GROSS E. R. COHEN M. J. HIGATSBERGER A. DE SHALIT A. O. C. NIER J. W. M. DuMoND H. H. STAUB B. S. DZHELEPOV D. M. VAN PATTER A. H.
Session I. Theoretical.- Paper 1. Nuclear Masses and Nucleosynthesis.- Paper 2. Mass Laws and Nucleosynthesis.- Paper 3. Semi-Empirical Analysis of Nuclear Masses.- Paper 4. Empirical Separation Energies and the BCS Pairing Theory.- Paper 5. A New Nuclidic Mass Law.- Paper 6. Semi-Empirical Interpretation of Nuclear Masses and Deformations.- Paper 7. Construction of an Extended Nuclidic Mass Table.- Paper 8. Status Report on Atomic Masses.- Paper 9. Considerations about Programming Mass Adjustments.- Paper 10. Some Statistical Problems in the Computation of Nuclidic Mass Formulae.- Session II. Fundamental Constants.- Paper 1. The Proton Gyromagnetic Ratio as a Nuclear Standard.- Paper 2. Precision ?-Ray Wavelength Measurement by Crystal Diffraction.- Paper 3. Precision Measurements on the Muon, Muonium, Positronium, and Helium as Related to the Fundamental Atomic Constant.- Paper 4. The Most Probable Up-to-Date Value of the Normal Molecular Volume V0 of an Ideal Ga.- Paper 5. The International Union of Pure and Applied Chemistry and its Interest in the Values of the Fundamental Constants.- Paper 6. Present Status of our Knowledge of the Numerical Values of the Fundamental Physical Constants.- Session III. Energy Differences Between Nuclear States.- Paper 1. Systematics of Single Particle Levels.- Paper 2. Separation Energies of Nucleon Pairs.- Paper 3. Mass Systematics Involving Low-Lying Excited States.- Paper 4. Nuclidic Masses and Structure of Nuclei.- Session IV. Calibration Energies for Nuclear Measurements.- Paper 1. Energies of Natural Alpha Radiators.- Paper 2. The Energy of Polonium Alpha Particles as Determined by Different Methods.- Paper 3. Atomic Effects on Nuclear Reaction Yield Curves.- Paper 4. Nuclear Resonance Energies.- Paper 5. Absolute Energy Standards for Van de Graaff Accelerators.- Paper 6. Recommended Values of Calibration Energies.- Session V. Nuclear Q-Value Determinations.- Paper 1. Q-Value Measurements at M. I. T..- Paper 2. Nuclear Reaction Measurements at the National University of Mexico.- Paper 3. Q-Value Measurements at the University of Pittsburgh.- Paper 4. The Relative Masses of Some Uranium Isotopes Determined from Nuclear Reaction Studies.- Paper 5. Accurate Measurements of (p, n) Thresholds in the Proton Energy Range 5 to 10 MeV..- Paper 6. Q-Values as Measured Through Resonance Energies.- Session VI. Mass Values from Mass Spectroscopy.- Paper 1. Some Atomic Masses in the Region from Gallium Through Molybdenum.- Paper 2. Atomic Masses from Ruthenium to Xenon.- Paper 3. Recent Mass Values Obtained at McMaster University.- Paper 4. Mass Differences of Doublets Involving H, D, C, N and O..- Paper 5. A Direct Determination of the3H—3He Mass Difference.- Paper 6. Nuclidic Masses and Binding Energies of Nuclei from Samarium to Lutetium.- Summation of the Conference.